HomeMaccaferri organizes a transportation infrastructure technical training seminar in Hungary. 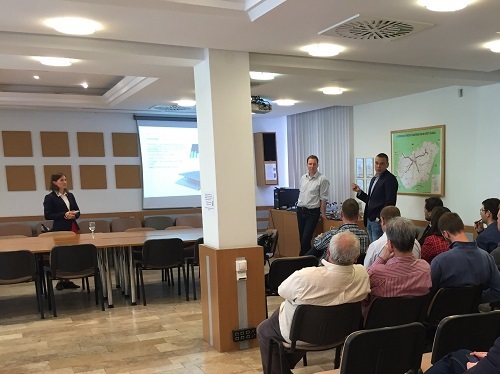 Maccaferri organizes a transportation infrastructure technical training seminar in Hungary. In cooperation with a team of Hungarian colleagues, Maccaferri Central Europe organized a technical seminar at FŐMTERV in Budapest relevant for transportation infrastructure. In cooperation with Hungarian colleagues, Maccaferri Central Europe organized on May 9th a technical seminar at FŐMTERV in Budapest. FŐMTERV is one of the largest designing consultant companies in Hungary. It was established in 1950 and it has successfully combined the values of many years of experience and engineering tradition with the ability of continuous technical renewal and adaptation to changing markets in the past more than six decades. Representatives of the Hungarian road and railway authorities were also present at the seminar. The seminar focused on principles of design and application of reinforced soil structures for retaining walls and bridge abutments – with a MacRes system – a reinforced soil structure with facing of concrete pannels. Also it covered durability requirements based on new European normative. Since in the past in Hungary, there was a negative experience with using of reinforced soil structures with facing from concrete panels, because of unproper reinforcement material for soil reinforcement use – glassgrids, many collapses of such structures happened, what had a negative impact on the general trust of the solution. Intention of Maccaferri is bring back the belive for this structures, since Maccaferri is one of the worldwide leading developers of the solution. Intention of presentations was also to show positive references and Maccaferri capability to design and install such structures for period longer more than 50 years.